Here are photos of my water gardens from 2016. I did have electric pumps in several of them, which provided, moving water, which I love. But that is hard to do on my patio due to the lack of electrical outlets. An alternative is to use solar fountains, but of course that only works when it’s sunny. Moving water will discourage mosquitoes from breeding in the water. 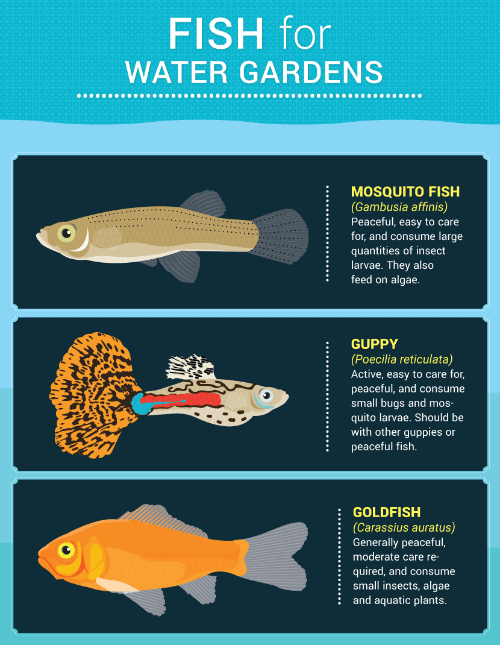 If you don’t have moving water, you can also add fish to your water garden to eat mosquito larvae. Or you can add mosquito dunks that kill mosquito larvae. From what I’ve read, Mosquito Dunks are safe to use around people, pets, birds, wildlife and fish. But I want to check into this more before I decide to try it. 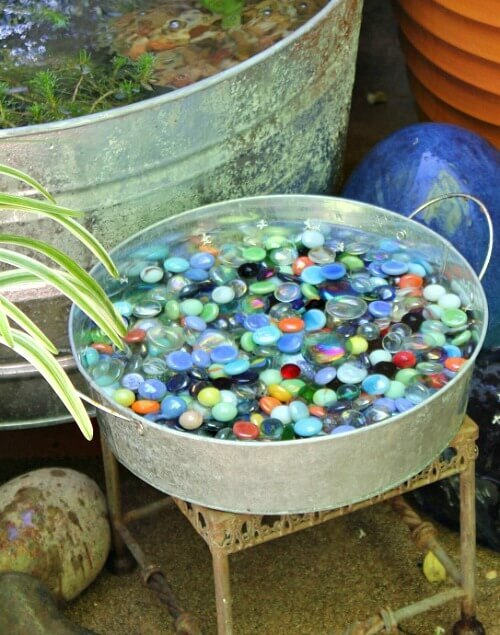 I also had a butterfly and bee bath that I created with a small galvanized container, water and flat marbles. Below are two water gardens that I found online for inspiration. You can find lots of ideas on Pinterest. 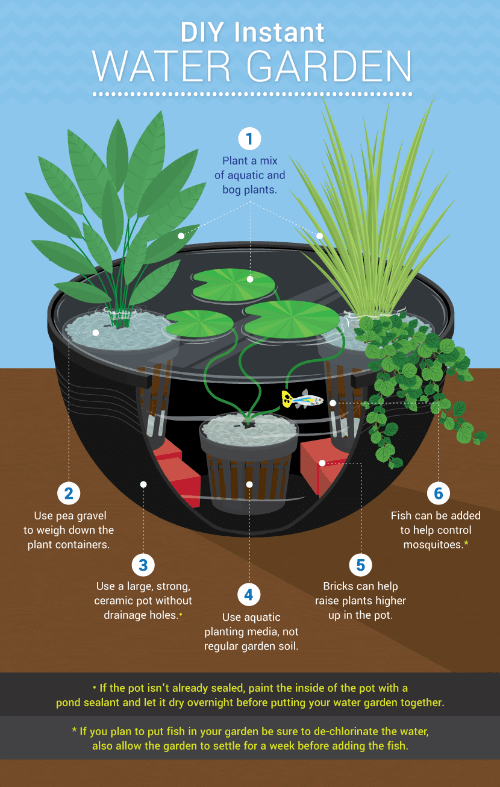 Below are aquatic plants you might look for at your nursery for your water garden. 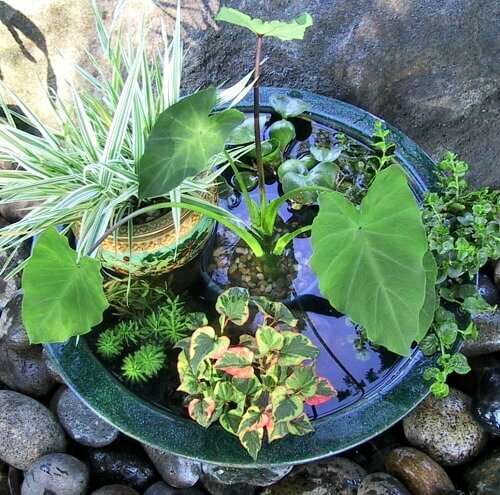 You will want marginal plants as well as floating plants. If you want to add fish to your water garden, the above fish are the ones you should look for. I’m still on the fence about the fish because I don’t know if the galvanized container might get too hot for the fish. Then what do you do with the fish during the winter? Mosquito fish are about an inch long and look similar to a guppy. A large female gambusia is capable of consuming over two hundred mosquito larvae in one hour. They are aggressive fish and they will begin to attack the larvae when they are only a couple of hours old. If you decide to add fish, wait 2-3 days after setting up your water garden so that the chlorine in the water has evaporated. Plant placement and management is key in mosquito control. Keep terrestrial plants from hanging over into the water to diminish shelter for breeding mosquitoes. Terrestrial plants are those plants which grow on land. 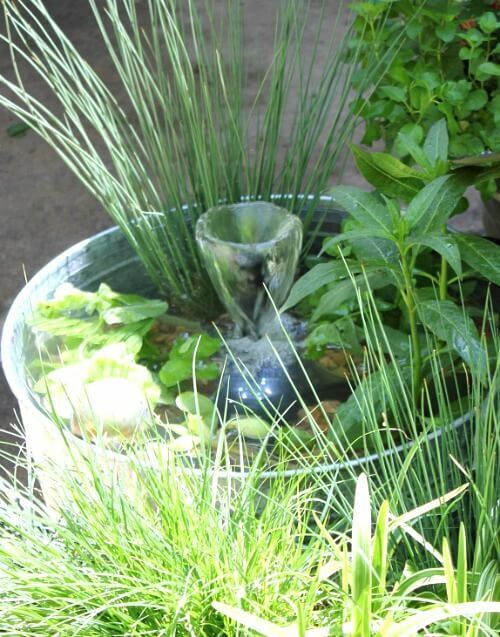 You can create any size water container garden. Whatever suits your fancy. 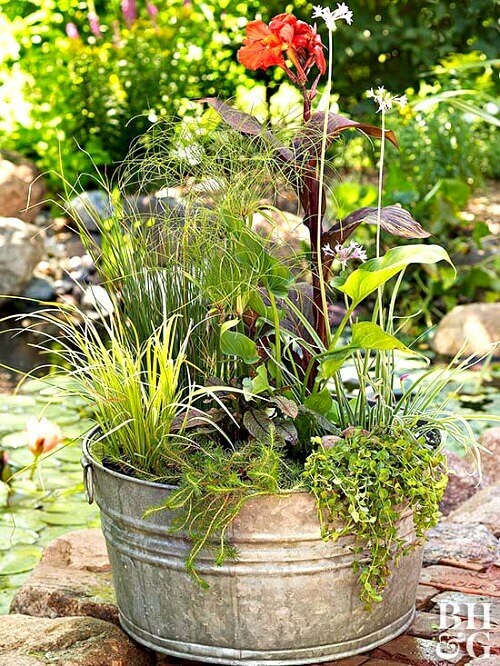 I like to use the galvanized containers because it is a decent size for various aquatic plants to thrive. 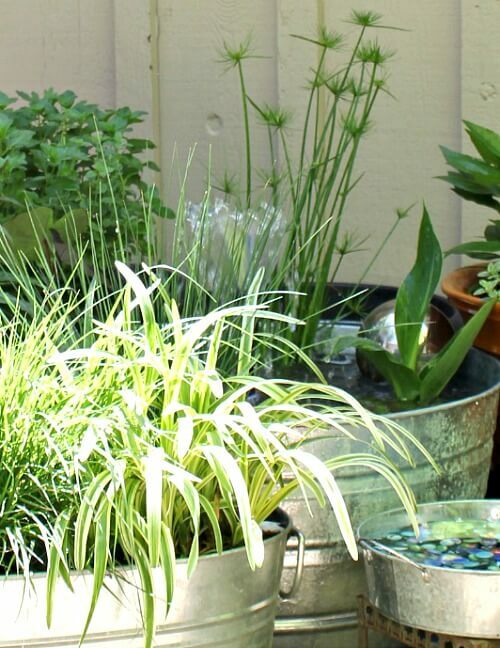 Are you considering adding a water container garden to your gardening space? Goldfish produce a lot of poop which can cloud the water. They also prefer cool water which won’t occur in a tin tub. I’ve used double wall resin tubs and that was still too warm for the goldfish… they died when the weather got hot. I tried a solar fountain. It was cheap so I wanted to see how it would work. Yes, it had to have direct sun and I enjoyed my water feature most in the evening. Then it stopped pumping and I tossed it. I wouldn’t buy another one. I think your water gardens were so pretty! Yeah, I notice the solar floating panel doesn’t seem to get good ratings. Hard to find a solution. I loved having them. But then that winter I lost the plants because I don’t exactly have room for water plants indoors. Not to mention losing the money I spent on them. Water plants aren’t all that cheap. So there’s that too. I love my goldfish pond/water garden! My last goldfish passed over the rainbow last fall though, so it is time to redo mine. I plan to take it all apart and clean it up and restock on the very next warm weekend. I love yours! Is your water garden in the ground? Love the butterfly and bee water bath. Must make one of those this summer. At the moment I have a heated water bowl for the squirrels and birds as it still gets so cold here. I would definitely like a water garden but not sure about keeping the water moving. I wouldn’t use fish as I would worry about them and what to do with them in the winter. We had quite an extensive pond at our last house and people always looked for fish, we never had any because again I would have to worry about their well being! I feel the same way. In Texas I had a gorgeous pondless waterfall. I always wanted to add a koi pond to my property, and someday I hope to. I did some research, and for fish to overwinter you need it to be at least 3′ deep in some area so they have water that won’t freeze. I’m still not certain how it would work up here on the mountain top, although I suppose I could use a little heater like I have for the birdbath. Someday!! And containers that deep are kind of expensive for me. water garden shows in the summer around our home town. I have always wanted a “water feature”!!! Years ago, I lived on property that had a waterfall and creek right out our windows….. I so loved that and miss it. 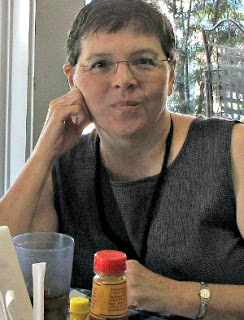 The waterfall was built by my ex-husband to cascade down some rocks into another creek that ran into a bigger pond – real, not manmade. It was wonderful and big. Now I live in a very dry climate with a very small backyard. We moved here 2-1/2 years ago and there is an area in the yard that was dug down and has cement “curbs” around it. I think it could easily be a pond, so that is my dream for this area. I’m not sure what it used to be.. has become a catch-all for the garden debris! I keep researching it… maybe one day it will get done! I may have to start with a small pot or tub with a pump though. That would be better than nothing on the HOT days of summer! I’ve tried both the solar pump and having fish in my water garden. Neither worked out well. I use mosquito dunks now. All of your water gardens are beautiful! I love mosquito dunks. It also comes in bits that you can spread on the ground. I do that in some shady damp areas. I wish it worked on the pesky (but cute) rabbits. I don’t think I’d go to the trouble of having a water garden but I would like to have a small fountain of waterfall just for the sound of the running water. Maybe this summer I’ll get around to it. I’ve always tho’t it would be nice right under my bedroom window so I could lie and listen to it on summer nights. I have a small pond in my front yard. I had a couple of koi in it and all but one were taken by raccoons! I saved the last one and in fact wintered him in my laundry room sink and he did quite well. Within the first hour of me reintroducing him to the pond a hawk swooped in and had a fine lunch. All that effort to keep him alive through the winter and then that? Poor koi.